Katie is originally from Eunice, Louisiana. She earned her associate degree in applied science in the physical therapy assistant program from Delgado Community College in 2013. 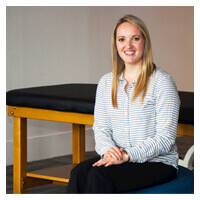 Prior to attending the physical therapy assistant program, Katie earned a Bachelor of Science in kinesiology from Louisiana State University at Baton Rouge in May of 2011. Interacting with diverse patients and contributing to their quality of life through rehabilitative treatment and education is very rewarding to her. Katie plans to continue expanding her knowledge in the field of physical therapy and will utilize newly acquired skills for the good of the patient. In her spare time, Katie enjoys cooking, spending time with friends and family, and partaking in all of the entertainment, culture, and vivacity the City of New Orleans has to offer.